Morningscore’s primary strength is that it provides high-quality SEO data for any industry and country. With a large keyword index, fast crawling capabilities and industry-leading partners, Morningscore offers all the necessary features one needs in SEO combined in an intuitive and user-friendly interface. How do you know if your SEO is profitable for your business? Morningscore is the tool that speaks the language leaders understand – $ and numbers. Get SEO reports that remind you of financial budgets. Get solid data to help you make the right SEO investments. What problems does Morningscore.io solve? 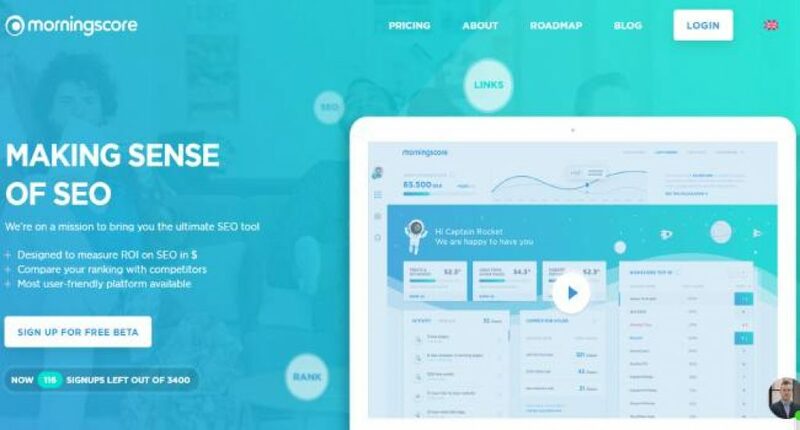 Morningscore focuses on the business side of SEO, bringing in new business-orientated metrics like ROI on SEO, SEO in currency and SEO investment suggestions. These metrics aim to help consultant and business owners attribute the right amount of business success to their SEO efforts. Additionally, with the help of several partners, it offers very high-quality keyword and backlink data. Morningscore’s mission is to lower the entry threshold for SEO and make it understandable and usable by businesses and this problem has been addressed with SEO missions similar to a checklist. Morningscore also allows you to closely monitor your competitors and make strategic decisions so that you can get the most out of your SEO. Having worked with many clients over the years as a web agency, we always looked for credible ways to show the value of our SEO work to our clients. Attributing this was hard because all of the currently available metrics were based on the terms specific to the SEO industry, with no business-focused alternatives. We weren’t’ satisfied with the majority of the tools out there in terms of accuracy and features. That is what led to the creation of Morningscore. Making sense of SEO is my passion. Leaders need a SEO analytics tool that is like reading a financial statement. Morningscore.io is that tool. I love to create things and help them grow. Interaction with (all sorts of) people gives me energy and feeds my curiosity greatly.